A well made Quiche is such a treat. 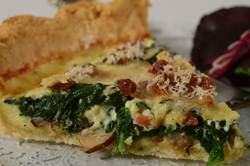 This Quiche recipe flavors the savory custard filling with bacon, spinach, diced shallots (or onions), and grated cheese. It is good warm from the oven, at room temperature, or even cold. Serve it with a green salad for brunch, lunch, or even for supper. A Quiche is defined as an open faced savory tart (pie) filled with a smooth and creamy custard-like filling. The name "Quiche" comes from the German "Kuchen" which means "cake". Quiche originated in the Lorraine region of France and the classic 'Quiche Lorraine' has a filling made with beaten eggs, cream (milk) and bacon. Today, a Quiche can have a wide range of flavors and while it normally has a custard filling, with bacon (or ham, sausage, or some kind of meat), it often includes vegetables and cheese. My personal preference is to use a prebaked pastry crust when making a Quiche, as it helps prevent the crust from getting soggy once the filling is added. (There is a Prebaked Pie Crust recipe, along with a demonstration video, on the site.) The savory custard filling is so simple to make. Just whisk together the eggs, cream, and milk. (You can adjust the ratios of cream to milk depending on how rich you want your Quiche to taste.) Because the Quiche has such a short baking time, I like to cook the bacon, spinach, and shallots before they are added to the custard filling. You can use bacon or turkey bacon or even ham or sausage meat. I like to use fresh spinach that is steamed until wilted (although you could saute the spinach until wilted in a large skillet), then rinsed and gently squeezed to remove excess water (can use an equal amount (about 1 cup (240 ml)) of frozen spinach that has been thawed and squeezed dry). And if you like you can replace the shallots with and equal amount of diced onion and one finely chopped small garlic clove. Of course, a Quiche needs cheese and there are a variety of cheeses you could use. Gruyere, Parmesan, Cheddar, and Pecorino Romano are some of my personal favorites, but feel free to experiment. The Quiche is baked just until it is nicely browned and the custard filling is set (a knife inserted one inch (2.5 cm) from the edge comes out clean). Let the Quiche rest at room temperature about 15 minutes before serving. Leftovers can be covered, stored in the refrigerator, and simply reheated. Quiche Recipe: Preheat oven to 375 degrees F (190 degrees C) and place rack in center of oven. Have ready a prebaked 9 inch (23 cm) pie (or tart) crust. To steam the fresh spinach. You will need a large pot and a steamer (or heatproof strainer). Place just enough water in the pot so it comes to the bottom of the steamer. Bring the water to a boil then place the spinach in the steamer, cover the pot, and 'steam' the spinach just until it is wilted (about 3-4 minutes) (toss the spinach periodically). Then remove the steamer from the pot, drain the spinach, rinse with cold water, gently squeeze the spinach to remove excess water, and coarsely chop. In a large skillet, over medium-high heat, fry the bacon until crisp. Remove from heat and place the bacon on a plate that is lined with paper towel (to absorb the fat). Then cut the bacon into bite-sized pieces. In a saucepan, with about 1 tablespoon of bacon fat or oil, saute the diced shallots until soft. Season with salt and pepper. Remove from heat and add the chopped spinach and bacon. Spread the mixture evenly on the bottom of the prebaked pie crust. Sprinkle with the parmesan cheese. In a large bowl whisk together the eggs, cream, and milk. Season with salt and pepper and cayenne pepper (if using). Pour over the spinach and bacon mixture and bake in the preheated oven for about 20 - 25 minutes or until nicely browned, the custard is set, and a knife inserted one inch (2.5 cm) from the edge of the crust comes out clean. Remove from oven, place on a wire rack, and let cool about 15 minutes before serving.